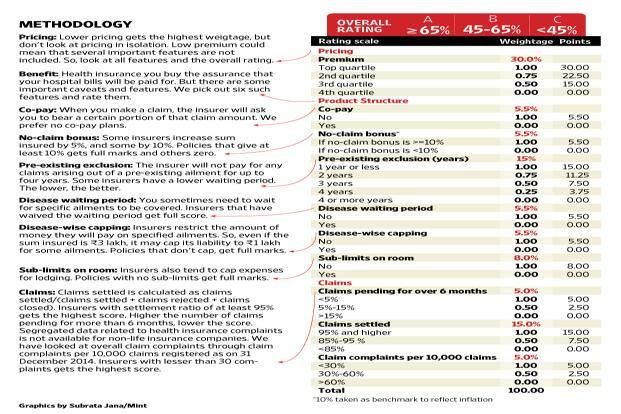 ........ A health insurance policy packs in several features and caveats. To give you a ready comparison, we designed Mint Mediclaim Ratings (MMR), which was developed by SecureNow Insurance Broker Pvt. Ltd. 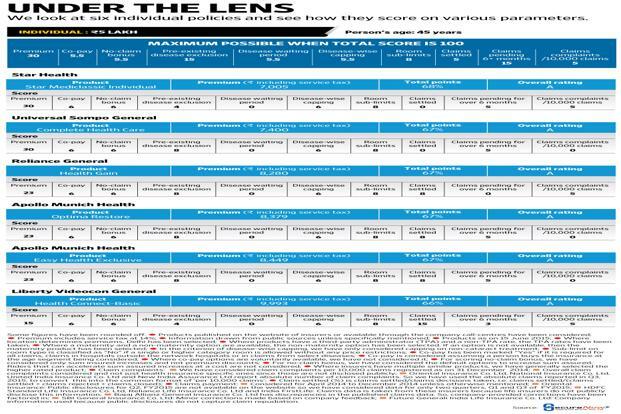 The full ratings along with the methodology can be seen here: http://www.livemint.com/mintmediratings. In the ratings, for family floater plans, we have considered two sum insured amounts (Rs.10 lakh and Rs.20 lakh) and three age categories in each—eldest insured member is 35, 45 or 65 years old. For individual plans, the age categories are the same but the sum assured is Rs.5 lakh. The newest edition of the ratings (July 2015) also includes individual plans of Rs.5 lakh, Rs.10 lakh and Rs.20 lakh for a person aged 70 years. This week, we spotlight individual policies with sum assured Rs.5 lakh, where the person is 45 years old. Let’s look at sub-limit on room rent. This means that your insurer would have decided the amount that it would pay towards hospital room rent. While some may describe this cap as a percentage of the sum insured, others may describe it as the category of room you would be eligible for. You need to be VERY VERY careful when buying a health insurance plan with sub-limit on room rents because usually other medical expenses are associated to the type of room you take and so you could end up paying the difference for not only the room rent but all other medical costs should you opt for a higher room category than allowed. You would typically find sub-limits on very low ticket size policies, but it’s always advisable to go for a health insurance plan that does not have sub-limits. So, policies with no sub-limits get the highest score. Co-pay is a fixed percentage of the hospital bill you will have to pay when you make a claim, while the balance will be paid by the insurance company. For e.g. If your policy has a 10% Co-Pay clause, it means for a Rs 1,000 claim, you have to pay Rs 100 while the insurer will pay Rs 900. Ideally, opt for a "no co-pay" plan so you don't have to shell out for every claim. The duration of coverage is the most important factor in buying a health insurance policy. Your health is most likely going to deteriorate only in your sunset years so ensure that your coverage is lifelong and not for a few years. Always go for a plan that can be renewed lifelong. Pre-existing diseases are classified as diseases/conditions that a person has before buying health insurance. All pre-existing diseases aren't covered from day one of buying the policy. The time taken to cover pre-existing diseases will vary from plan to plan. 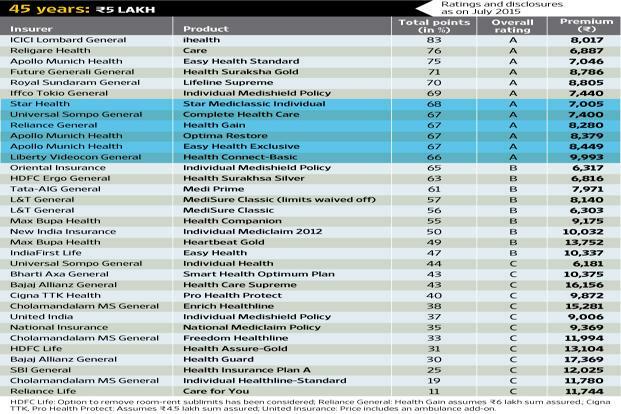 Check the amount of time taken to cover pre-existing diseases in your plan. Your room preference during hospitalization matters (such as shared room, private room or private room with high-end facilities). A costlier room means you'll pay higher treatment and hospitalization charges! It's better if your plan has a higher room rent limit per day. Extremely thankful to you for sharing these best individual insurance plan up gradations. I thought lic jeevan anand returns are according to premium amount, however, my financial planner changed my perception and explained all.